Quinn is an entertaining version of the Tetris game for Mac. With a very appealing interface and with a complete integration with the operating system, this game will keep you entertained during your free time in front of your computer. 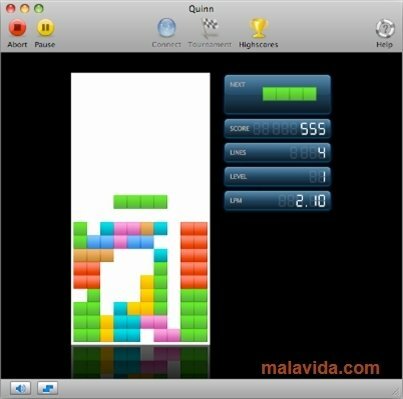 The dynamics are the same as in the original Tetris: pieces with different shapes keep on falling, and your mission is to order them so that they fall and form rows that will disappear. As you manage to make lines disappear you will move up in level. - Possibility to choose the level and the difficulty. - Possibility to play online. - Online database with the best results. One of the game modes that Quinn includes is a tournament mode. 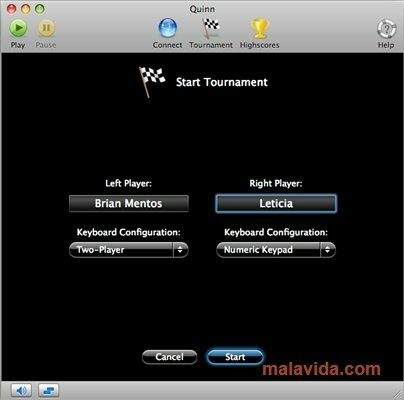 In this mode you'll be able to play with another person on your computer to see who is the winner of the competition. Compete against your friends online and manage to be the best in this entertaining puzzle game with which you can have plenty of fun while completing rows.